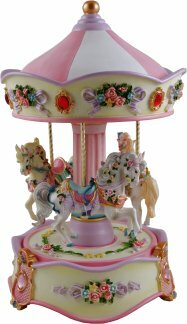 A gorgeous pink & lilac musical carousel with three individual decorative horses. Delicatley hand painted, the horses are each mounted on brass rods and as the top rotates the music box plays. Highly detailed casting, meticulously hand painted in creams, pinks & lilac with delicate gold & rose embellishments.